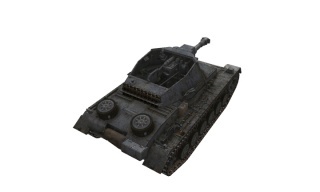 The Pz.Sfl. 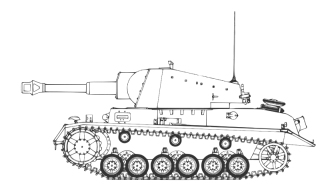 IVb is a German tier 4 turreted self-propelled gun. 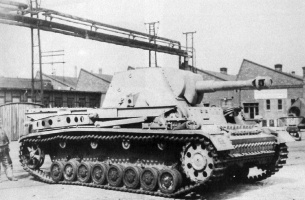 An SPG prototype equipped with a 105-mm howitzer. 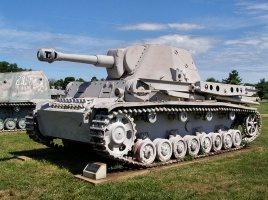 The original variant was developed in 1939 by the Krupp company. In 1940, some changes were introduced to the project. 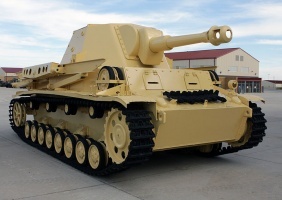 The first two prototypes were manufactured by January 7, 1942. 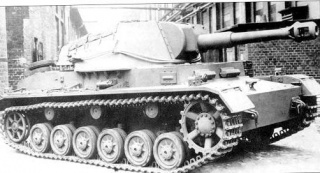 In the same year, the prototype series of 10 SPGs was produced: 6 vehicles entered service, while the other 4 were used by the Wehrmacht training units. The Pz.Sfl.IVb is an excellent SPG due to its versatility, high ammo capacity, and excellent gun elevation and depression; it also has an excellent camouflage factor, making it a serious threat to enemies. 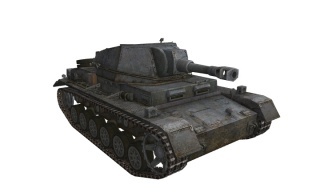 To top it off, it can even fire AP rounds which can easily penetrate the roof armor of enemies and cause devastating effects, that is, if they manage to land on it. The downside of this SPG is its very long aim time and very poor mobility. 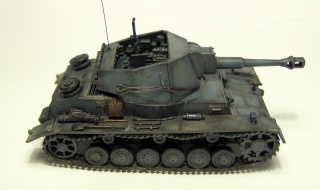 The Pz.Sfl. IVb leads to the Grille. This tank is incredibly fun to play. 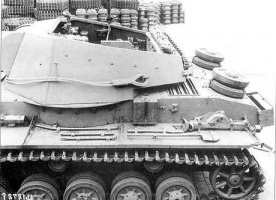 While it is quite serviceable as a standard artillery, its very high damage gun, plus its ability to fire AP rounds from its top gun, mean that it can fulfill a very effective ambush TD role as well. Its gun suffers the same issues facing other SPGs trying to play as TDs: a lack of the sniper view, slow shell trajectory, low accuracy, and long aim times. As a result, you will likely have to rely on a good bit of luck or simply sitting still for a while to let the aim circle narrow; playing as an ambush-type TD allows you to pre-aim at likely avenues of approach and start counting down the 5.5 second aim time. If you do choose to act as a TD, stick to enclosed spaces or bottlenecks where tanks have to come through in single file or at lower speeds. If you get into a close-range fight with multiple tanks on each side, you probably don't have time to relocate, so take up a punishing position and fire AP rounds at vulnerable parts as enemies try to peek and shoot. The long reload time on both guns will make this a risky venture, however. 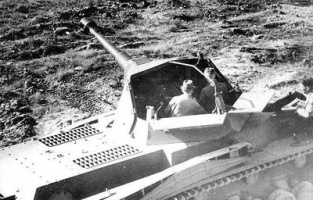 Scouts are going to be a pain, but less so than other SPGs; while you'll be able to one-shot most of them much like any other SPG, you have a much wider arc of fire, which will render circling less effective against this SPG. As always, being tracked or simply outmaneuvered will leave you at a disadvantage, since your pitiful traverse will make you an easy target. 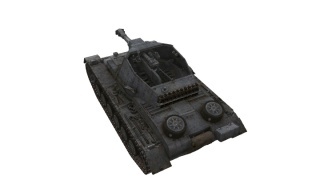 In the traditional SPG role, the Pz.Sfl. 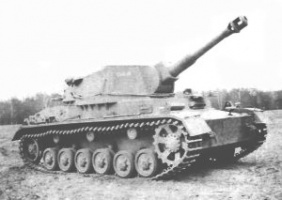 IVb benefits by being the most accurate artillery for its tier (tied with the Birch Gun), and indeed, one of the most accurate artillery in the game. 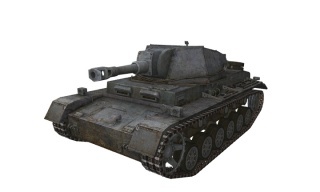 This makes its AP and HEAT shells notably more useful thanks to the increased probability to score direct hits on enemy tanks. While it cannot unload DPM like the T82 HMC, it can do so with greater accuracy. 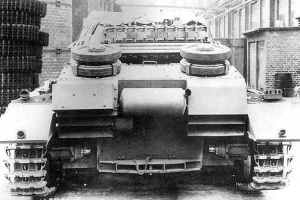 A Brothers-in-Arms crew, gun rammer, gun laying drive, and chocolate can bring the reload time down to around 12.5 seconds (and the rate of fire up to about 4.8), the aim time down to 4.5 seconds, and the dispersion down to .65, making this vehicle extremely lethal when upgraded and fully equipped. 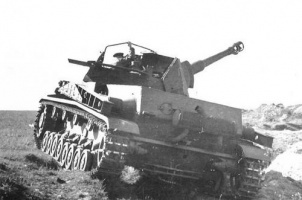 As a result, this SPG remains competitive even in higher tiers; much like the Birch Gun or FV304, some players grow to hate this SPG for its ability to constantly keep a tank tracked. For consumables, consider using the 100 or 105-Octane Gasoline for the 5%/10% boost (respectively) to both engine power and turret traverse speed. Due to its low health, poor speed, and weak armor, most engine fires are not survivable, and a fire extinguisher is usually unnecessary. The stock configuration isn't terrible, and upgrades don't bring anything very new to the tank except some minor stat upgrades. Sadly, none of the radios from the Wespe, or even the G.Pz. Mk. VI (e) carry over, as the Pz.Sfl. IVb is closer to an actual tank than a self-propelled gun. 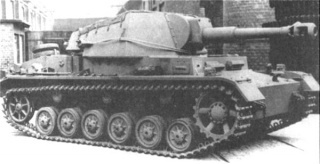 The Fug 7 is a staple of earlier tanks and goes back as early as the Pz. I and II. The Fug Spr. 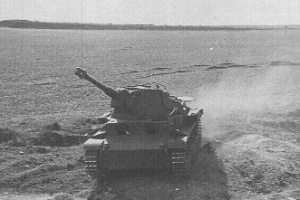 A can be picked up from Pz.Kpfw. II Ausf. 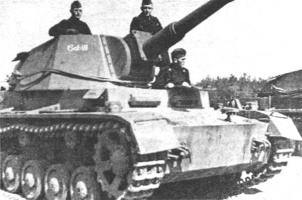 G, or maybe the Pz.Kpfw. I Ausf. C, if you've delved any into the German scout tree. 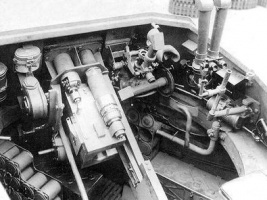 You may wish to pick up the engine or the upgraded gun first; traverse speed is less important on this SPG, compared to others, because of its turret’s wide field of fire. The suspension isn't required at all, as you can mount every module without having to upgrade it. This page has been accessed 86,160 times.